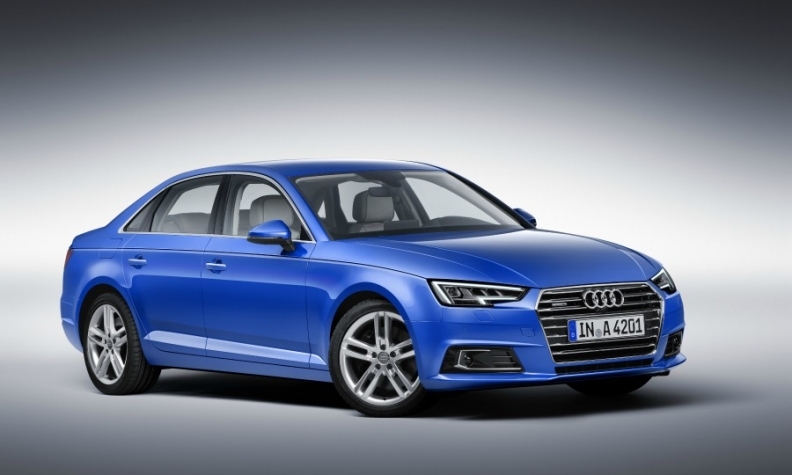 The new Audi A4 has a wider grille and redesigned headlights. FRANKFURT -- Audi today released details and pictures of its new-generation A4, whose success will be crucial to automaker's goal of passing BMW as the world's top-selling premium brand. The new A4 is slightly larger than the current model, which is its global best-seller, but is lighter and has a more spacious interior. The latest A4, a competitor to the BMW 3 series and Mercedes C class, is slightly larger than the current model with a bigger, revamped interior. The A4 keeps its conservative styling to appeal to business fleet buyers whose purchase choices are based more on rational than emotional decisions. The A4 is the second Audi after the Q7 large SUV to use Volkswagen Group's second-generation MLB modular architecture. 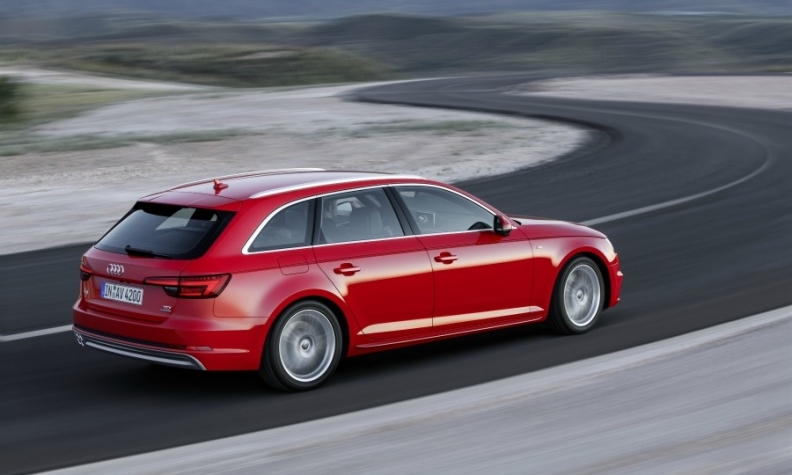 The A4 has the best drag coefficient in its class at 0.23, Audi said in a statement. It is up to 120kg (265 pounds) lighter than the current car despite growing 25mm in length to nearly 4730mm (15.5 feet). Its wheelbase is 12mm longer at 2820mm (9.3 feet), boosting cabin space and rear passenger legroom. Thanks to the better aerodynamics and lighter weight, fuel consumption drops by as much as 21 percent while performance output increases by 25 percent. The new A4 offers Audi’s fully digital instrument cluster dubbed a “virtual cockpit” as an option. It has a 12.3-inch liquid crystal driver's display. Additionally the top-end infotainment system, MMI Navigation plus, offers a high-speed LTE connection, Wi-Fi hotspot and an 8.3-inch screen with a new voice-control system. The A4 has a tablet-style infotainment screen. Soon after launch, customers will be able to order a detachable Audi tablet for rear seat entertainment or navigation. The Android-based device has a high-resolution 10.1 inch display and connects to MMI Navigation plus through the car’s Wi-Fi. Audi claims the A4's handling has dramatically improved thank to its redeveloped, forged aluminum five-link front and rear axles and all-new electromechanical power steering. For the first time, adjustable shock absorbers and variable damping allow drivers to select between two suspension settings - sport or comfort - standard for models with 190 horsepower and more. The A4 will have three gasoline and four diesel engine choices in Europe, ranging from 150 hp to 272 hp. The most efficient engine, a 150-hp, 2.0-liter diesel, has CO2 emissions of 95 grams per km and consumes 3.7 liters per 100km. Audi did not disclose information about the car's U.S. engine lineup. A spokesman said U.S. engines will focus on gasoline units but there will be a diesel. Starting late 2016, Audi plans to offer an A4 Avant g-tron that can run either on natural gas or the brand’s own sustainably produced e-gas, the second such model after the A3 Sportback g-tron. A plug-in hybrid version is also expected, although not confirmed by Audi. Audi has not disclosed pricing for the new A4. The current model’s sticker price starts in Germany at 33,150 euros including tax for the sedan and 34,900 for the Avant wagon. The A4 is the last Audi styled by Wolfgang Egger who moved to Italdesign Giugario in early 2014. It will have its public debut at the Frankfurt auto show in September and will go on sale in Europe by the end of November. The U.S. launch is planned for mid-next year. Audi sold 327,500 units of the A4 sedan, Avant station wagon and A4 allroad quattro last year, down just 3.8 percent even though the model approaching the end of its life cycle. That means nearly one out of every five Audis sold in 2014 was an A4. BMW sold 480,000 units of the 3 series, which is the best-selling premium midsize car globally. Audi is spending 24 billion euros on technology and production in the next five years as it seeks to topple BMW from the No. 1 spot in the luxury-car market by 2020, an ambition also shared by current No. 3 Mercedes. Audi was the No. 2 by vehicle sales last year. BMW remained the luxury leader in the first five months with global sales of 759,609, up 5.2 percent. Audi's volume rose 4.3 percent to 744,900, while Mercedes, boosted by new products, saw sales increase by 14 percent to 728,809.